Ice cores are cylinders of ice, drilled from an ice sheet or a glacier. They are usually 10 centimetres in diameter, and can be taken from deep in the ice. 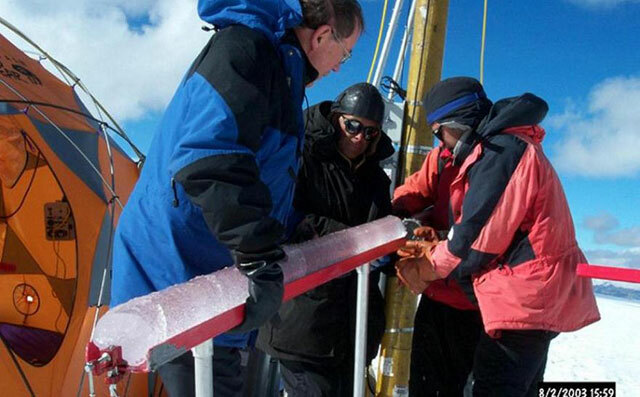 Ice cores provide trapped samples of ancient air. "Air bubbles trapped in ice are like little time capsules that record the past atmospheric composition. "So we measure loads of different gases, and essentially we can measure greenhouse gases such as carbon dioxide and methane." Most ice core records come from Antarctica and Greenland. Law Dome is a location in Antarctica. The evidence in Law Dome ice cores shows that since the 18th century, when the Industrial Revolution began, the level of carbon dioxide has risen. It has changed from around 280 parts per million to 315 ppm when Keeling began his records in 1958. Now it has reached around 400 ppm, a rise of 85 ppm in just 56 years. The longest ice cores are from 3km deep in ice. The oldest ice core records extend 123,000 years in Greenland, and now to 1 million years in Antarctica. Ice cores contain information about past temperature, and about many other aspects of the environment. The graph shows how carbon dioxide has increased and decreased over hundreds of thousands of years. The most recent glacial stage occurred between about 120,000 and 11,500 years ago. Since then, the Earth has been in an interglacial period called the Holocene. During glacial stages, CO2 levels were around 200 parts per million (ppm). During the warmer interglacial periods, they hovered around 280 ppm. In 2013, CO2 levels passed 400 ppm for the first time in recorded history. This rise in CO2 is caused by burning fossil fuels. A new study using evidence from a highly detailed ice core from West Antarctica shows a link between abrupt temperature changes on Greenland and Antarctica during the last ice age.